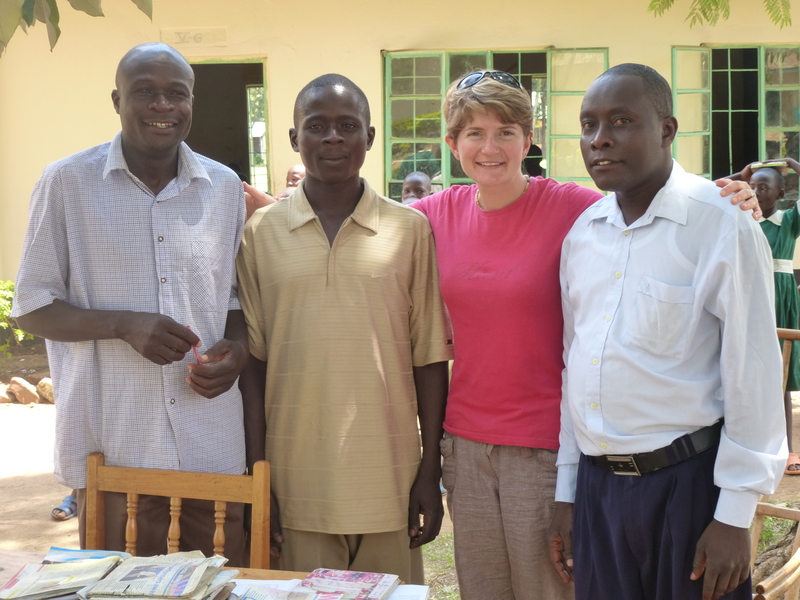 (Left to right) Michael, Daniel, (Becky) and Hesbourne, Kenya, February 2014 – the three KCEP teachers – whose entire salaries are funded by kind donations to the KCEP. When KCEP first started supporting Madungu Primary, the school had 700 pupils and only 12 teachers. This meant huge class sizes and often lesson time with no teacher. Since 2006, KCEP have been paying the salaried for two to three additional teachers. Michael is a gifted maths teacher, his pupils often achieving top results in their external exams and Hesbourne teaches Swahili. Recently, a third Kenya Project has been employed, Daniel. KCEP is proud of having helped to improve the teaching capacity at the school. Some teachers have also been lucky enough to have found individual sponsors in the UK to pay for them through teacher training college or university.